"Enric Duran is working with a new electronic currency that seeks to contribute to the creation of a cooperative global ecosystem able to compete with capitalism. The currency is based on values of cooperation, solidarity and equality, and puts aside the individualism that, according to the activist, defines Bitcoin. Faircoin was created in early March 2014 by an anonymous developer who then left without a trace. 50 million coins were created and then distributed between the 6th and 8th of that month, at a rate of 1,000 units per hour; given as gifts to whoever signed up to receive them. It became the first virtual currency that did not initially have to be mined, and that was shared equitably in order to promote equality between participants. The currency was orphaned until last summer. Between April and May, Enric Duran, the famous Catalan Robin Hood, rescued it with the help of Thomas König, a software developer with over twenty years of experience. Faircoin is a cryptocurrency whose name refers to economic justice and fair trade, and that corresponds to the values that Duran has always advocated. An activist who went public after defrauding the banks between 2006 and 2008 for around 492,000 euros in loans. He claimed that he wanted to refurbish his apartment or buy a car, had payroll and other false documents and even created shell companies to support his scam. His intention was always to allocate that money to fund social movements in order to teach a lesson to the financial system and demonstrate its weakness. So he became known as ‘Robin Hood of the Banks‘, who swindled the rich to give to the ‘poor’. His activities have led him via prison to spending a long time in hiding. He retains the hope of being completely free, although he admits that the there is still a long way to go for that to happen. Despite the obstacles and being a wanted man, he continues his long struggle: to build alternatives to the financial system, this time using Faircoin. König became responsible for controlling the technical aspects of the cryptocurrency, working to ensure its security and adapting it to better suit Duran’s vision. “When nobody paid attention to it and it had no value, I and others dedicated ourselves to buying the faircoins,” says the Catalan to HojaDeRouter.com. When they had acquired a significant quantity of Faircoin, they launched the project publicly. And so Faircoin became the official currency of FairCoop, an open cooperative, global, born in mid-September 2014 “as a cooperative of cooperatives and other social and collaborative initiatives.” Now the number of coins exceeds 50 million, each valued around 0.0184 euros ($ 0.0201), with about 10,000 users and a market capitalization exceeding 950,000 euros (just over one million dollars). Since the beginning of 2015 you can buy faircoins by card or purchase by bank transfer and exchange them for cash at 10,000 ATMs in Spain thanks to Getfaircoin services and Fairtoearth. Together, Faircoin and FairCoop promote a new global system of “post-capitalist economy” based on collaboration and free software. The cryptocurrency has become one of its main pillars, functioning as an exchange currency and a store of value.” Thomas König explains that it promotes solidarity by allowing anyone to transfer value to other people quickly, securely and cheaply, without relying on centralised governmental or financial powers. In addition, “a cryptocoin can be a useful tool to generate a social movement and mutual support networks around it, and to bring the “virus of cooperation” to the money markets, says Enric Duran. With Bitcoin, users give up part of their computer resources so that certain tasks can be performed (as control transactions in a decentralized manner). It is part of what is known as “mining” – a process by which the coins get assigned by the algorithm: if you’re a user and you mine, you might get some coin. The more computing resources you devote to mining, the greater the probability of reward. With Faircoin, users also utilise their own resources, but in this case the mining is minimal (0.01% of the process). When it does happen, it functions as a task on behalf of the community for which they receive a small direct reward. The goal, in this case, is not users competing for more and more coins, but cooperating. It is a very different philosophy. In the beginning, the faircoins were shared fairly in order to avoid the situation that only people with capital or resources (large servers) could access the coins. Here what matters is that the coins that already exist and those that will be generated serve the community, so that all users can benefit from them. Faircoin operation is based on the savings of all members of the community. The “savers” get more coins when they keep a certain amount of them for a certain time, thus causing the value of those faircoins to increase. It is a voluntary process that promotes solidarity within the network. So in the case of Faircoin it doesn’t make much sense to dedicate large servers to mining, which, according to Duran, greatly reduces the ecological cost which, “in the case of Bitcoin is very high”. The activist explains that Faircoin, although inspired by Bitcoin and retaining its essence as a means of payment, differs in its philosophy, or “what’s behind it.” In the case of Faircoin it is a community of people who collaborate and believe in the human being, trust between people and projects, and want to use Faircoin for the common good, to generate a collective vision and to improve society. “But in Bitcoin individualism, personal wellbeing, and individual profit predominate”. He gives us an example: in the early days of Faircoop, the cooperative received 20% of the money supply of Faircoin (around 10 million FAIR) to help out various projects around the world. These Faircoins were divided into three funds: the fund for the Global South, to help local projects (5 million FAIR) ; a fund for the Commons, designed to create and disseminate tools for the common good (2.5 million); and the fund for Infrastructure and Technology, funded with 1.5 million. Another million was invested in the development of Faircoop itself. König explains that he is currently working on a second version of Faircoin that introduces several significant changes. On the one hand cooperation will be more complete and no more reward will be generated; on the other, the privileges that so far the cryptocurrency grants to those most faircoins have by saving will be deleted. “So Faircoin be even more aligned with our values and become a more human cryptocurrency” says Duran. Both Duran and König argue that Faircoin, while important in Faircoop, is “nothing more than a tool within a global framework.” Progressively other tools will appear to “complete the monetary and economic ecosystem of Faircoop”, according to Duran. He explains that a just monetary system also needs access to credit that is democratic, that is accessible “to all persons having the capacity to produce”, and that at any given moment can cover people’s basic needs. This will be possible in the future with the other decentralized currency called Faircredit, which will be tasked with providing mutual credit. The loans will be interest-free debts that will become a revenue for others, and the sum total of all balances in the system will be zero, so that credit will no longer depend on centralised banks but the common good. The appearance of Faircredit will not lead to the disappearance of Faircoin, but they will be used together as complementary currencies. A NEW ECONOMIC, SOCIAL AND FINANCIAL SYSTEM? Duran explained that the initiative to create a global ecosystem cooperative does not intend to make capitalism disappear directly, or even imply that capitalism can disappear. “It means that we have a space in which, voluntarily, cooperatives, individuals or groups who wish to participate in it can generate an environment that can be sufficiently autonomous and independent of the current capitalist system.” That is, to live together in order that citizens can choose which of the two want to participate. He is convinced that, ultimately, it will demonstrate that it works much better than the capitalist system. And what about those people who do not understand cryptocurrencies? How do you win their trust? Duran knows that making this model accessible to people is a challenge, but the first priority is to “build a strong and robust system” that can then be introduced to those for whom the technology is more distant. For now the work is to encourage social groups to accept donatons in Faircoin, and in May work will begin to encourage businesses, freelancers and cooperatives to use it. FairCoin is a currency created for the purpose of promoting equality and economic justice. 50,000,000 faircoins were created in March 2014, and between March 6 – 8, were distributed through a massive give-away called an “airdrop” at a rate of 1000FAC/hour to anyone who made a request. FairCoin became the first currency which needed no initial mining but was distributed equitably in order to promote equality of financial possibilities. Still, obviously an airdrop on an Internet forum has a very limited scope, and therefore the initial distribution isn’t quite sufficient in its equity purpose. Currently, FairCoin has been adopted by fair.coop's promoters as the cooperative’s currency for use as a means towards global economic justice. The key purposes of the cooperative regarding FairCoin is using it to generate economic redistribution while it also increases the level of justice, supports the empowerment of grassroots groups, transformation of social and economic relations, and creation of commons (Fairfunds). 99.99% POS: It is a hybrid POW / POS system but money creation is 99.99% POS. Thus, the majority of faircoins are minted, ie, the system works thanks to everyone’s savings. As for security, there is a POW block every 5 minutes, and a POS block every 10 minutes. These two methods are combined to provide the best of each in securing the system. The low remuneration for mining, 0.001FAC / block, prevents energy waste since using high consumption mining devices is just not worth it. Money Supply of 50,000,000 coins mined out in the first block and initially spread out to all who applied for it, so that not only those with capital or mining resources could have access. Savers, ie, people connected to the network and minting, will receive 6% of the coins during the first year, 3% the second and 1% from the 3rd year on. Some of these features may be changed by consensus on the network in benefit of FairCoin, a topic on which Fair.Coop and its members have a lot to say. In fact, since Fair.Coop is based on open political participation, we can say that Fair.Coop adds to FairCoin with an approval based on agreements between humans– which, to our knowledge, no other cryptocurrency does. We call it “human-based consensus”. You can currently buy with bitcoins in some exchanges. First, you must sign up with an email and password and send them your bitcoins. You can buy bitcoins in a number of places on the Internet. Here are some guidelines on for how to do this. You can download the FairCoin wallet here. Once downloaded, we recommend you follow this tutorial. Also, a campaign is active on Coopfunding which combining donation and investment linked to the Fairsavings service in a single action done by card or bank transfer. You can participate as a FairCoin active node anytime by using the software on your computer, waiting for 21 days, and then start minting. Meanwhile, you can participate by mining (POW). After 21 days, if your coins haven’t been moved from your wallet, you can begin contributing to the network with POS. At that moment your wallet will begin to have a % chance of minting which will be reflected in the official “minting view” tab on the faircoin wallet. Wallets with the most faircoins are likely to find a block faster. Another factor affecting the chances of finding blocks is the concept of “age”, which makes minting probability grow each day after day 21, up to day 90. Notice that once you discover a new transaction block, its minting status is set back to 0 and the process starts over. We could go on explaining, but the best way to learn is to download the wallet and start experimenting with your faircoins. "We decided to create a new version of FairCoin which corrects issues we encountered. The current version of FairCoin relies on PoS (proof-of-stake) which cannot be considered fair, because it confer an advantage on the already rich. Therefore we needed to come up with a new way to secure the network. We call it PoC (proof-of-cooperation). This innovation will finally make FairCoin fair, secure, and sustainable. Certified Validation Nodes ( Web of trust ) No money creation. Fees go to node operators (dynamically adjustable) Regular/predictable time for block creation. Instant transaction confirmation. Easily forkeable. Faircoin as a currency should be one of the coins using this proposed 'blockchain of the commons'. Certified Validation Nodes (CVN) Until now, each node in FairCoin network validates transactions and creates new blocks to achieve distributed consensus, but with the new version this will be done by a network of Certified Validation Nodes. These nodes cooperate to secure the network and they are in charge of transactions validation and blocks creation, in a process called Proof of Cooperation. In short, the nodes work together in a collaborative way, creating blocks in a rotative sequence. These nodes use Web of trust, a system to establish their authenticity. To run a CVN one needs to complete a certification procedure that is operated by FairCoop. The ideal number of CVNs in the Faircoin2 network will be between a minimun of 10 and a maximun of 50-60. The blocks creation will be fixed in a regular and predictable time, about 3 or 4 minutes. One of the main differences of the new version is that there is no new money creation. In the first version the block creation was rewarded with new money, but this will be no longer so. The CVNs could be rewarded with transaction fees, which could be dynamically adjustable. In version 2.1, the transactions will be confirmed in a very small time, near the time spent to confirm a buy with credit card, almost instantaneous. This will be a direct consequence of the way CVN networks confirm transactions. A blockchain without money creation and based in certified nodes is an innovation that has received interest from different initiatives collaborating in FairCoop. Mainly the payments cooperative that is being developed. It makes sense to share the same main software characteristics, and then adapt the forks to the specific needs of each project. Shareable: What's the importance of having a cryptocurrency focused on alleviating economic injustice and promoting social good? Duran and Troncoso: Up until now, cryptocurrencies have held great potential, but it hasn't always coincided with a practicality that would alleviate [social] ills. Certain elements such as bypassing the need for central banks are steps along the way, but there was something missing. A holistic social and economic system is urgently needed to address the inequalities inherent in the current system. How is Faircoin different from other cryptocurrencies? For one thing, Faircoin is technically different in the currency generation protocol used. Faircoin uses Proof of Stake (POS), instead of Proof of Work (POW). The use of POS prevents any unfair advantage which could be afforded to those who can access and invest in the environmentally destructive means of mining (destructive for its consumption of energy and resources needed for the servers). What really makes Faircoin different is its specific use as a tool for Fair.Coop, as a cryptocurrency designed to act as a store of value for Fair.Coop and its redistribution of capital to socially and environmentally coherent projects. What's the relationship between Fair.Coop and Faircoin? How will they intersect and/or interact? Our intention is to be “Fair in name, fair in practice.” Fair.Coop uses Faircoin as its social capital and store of value. Fair.Coop is Faircoin's conscience—it's a cryptocurrency attached to commons-oriented responsibility. Fair.Coop already holds 20 percent of all Faircoins in existence, which guarantees that the growth of the currency's value will go to the common good. This is guaranteed by Fair.Coop's democratic accountability system. Do you see Fair.Coop and Faircoin working on a global scale? What could that look like? In fact, Fair.Coop can't be anything but global; it's been specifically designed to be global; for this reason, we call it the Earth Cooperative. It's not a scaled-up local project. One of Fair.Coop's key objectives is to facilitate a global body of knowledge, capable of generating concrete impact locally. At any rate, we could make a working distinction between two sets of mechanisms that'd be produced by Fair.Coop: global and local. At the local level we'd be seeing local, specialized mechanisms and knowledge which, in turn, would feed into a global open knowledge economy comprised of, among other things, valuable data and monetary and economic tools. This will be a bidirectional relationship, as both parts will nourish one another for the benefit of the whole." Who will the funds raised with Faircoin go to? Do you already have organizations or projects in mind? If so, where are the organizations located? Who the funds will go to isn't something that's decided by the promoting team. Identifying who the potential benefactors are and following through is an ongoing democratic process of the whole coop, as it's coming together right now where each of the different Funds is co-managed by a council that works in conjunction with the other Funds, as well as with the entire community built around Fair.Coop. The type of organizations we want to work with will be those who could potentially generate peer production in the material plane, as well as benefit from the shared knowledge accrued by the coop. We also want to focus on projects that lack the necessary means to activate this type of peer production. Other examples would include strategic projects that can add more value to the global commons. Projects which, on their own, maybe wouldn't have the ability to network at this scale to share their knowledge. The projects would also benefit from the moral and material support of a global community if and when attacked by hostile interests. All in all, Fair.Coop will increase the resilience of these projects. "I like the procedures for validation of transactions that were developed and are described in the White paper. I am with the P2P foundation and am especially interested in monetary issues. Actually, I had hoped to see a completely new coin emerge starting with a clean slate, but I see that this was not really possible without major disturbance to the current owners of fair coins. 1) there are many of the existing coins (maybe more than half) still in the hands of the original Faircoin crowd and the Faircoin initiator. This may seem a small problem, but it could have some large consequences. 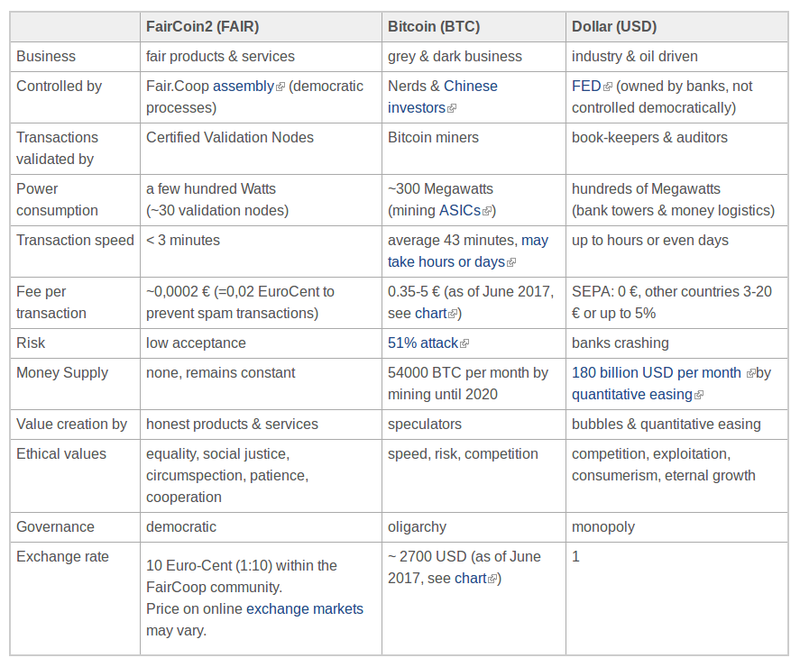 2) Faircoin has inherited from Bitcoin the existence of a limited supply of coins. Due to the supply being limited, and the request for coins being expected to increase, the price of each coin is also expected to increase. This could become rather serious, if we see Bitcoin’s price history as an example. It could lead to high instability in the price of the coins. Let me explain why I think this needs to be addressed and how to address it. Bitcoin and most of the alt coins have one severe flaw. They have a fixed limit of coins ever to be created. Why is this a problem, you might ask, the coin just increases in value over time and prices will have to be adjusted to take account of the increase. Yes, but… having a trend of increasing value, the coin becomes an object of investment, and of speculation. Some people (even ones disconnected from the FairCoop circle) will buy the coins to speculate on the increase. There is no way to prevent that, anyone can buy the coins on an exchange. With the coin becoming an object of speculation, the following problems will appear. 3) Prices as expressed in Faircoin can never be stable, they will have to follow the “value” of Faircoin as expressed in some external currency or other, or as expressed in the exchanged goods and services. This could become a major headache as price changes will never finish. There will always be fluctuations in the price of the coin and there will be a general increase of the coin’s value, since it is inviting speculative use by its very nature. Coins are bought up and “saved” by investors, and the resulting relative scarcity will act to increase the value of each coin. 4) FairCoop and its members will create value over time, which means that the currency faircoin will also gain value. This increase in value will majorly go to those who are holding Faircoin for its investment value, which are the current owners of a large part of all existing coins, and if 50% of those coins are currently in the hands of the original creators and the early adopters, then at least 50% of the value created by cooperative enterprise will end up in the pockets of those early adopters, or in the future, any investors coins are sold to. This could get worse in the future, if FairCoin becomes a known and respected currency that is expected to always improve its value. More of the coins may well be bought up by investors. In that sense, it could be that the valuable work of the cooperatives does not fully support the network but that a variable but rather high percentage of the fruits of this work is given to investors who purely hold the coins for speculative purposes. How to prevent such an essentially unjust situation from forming? A currency keeps a stable value if the units in existence are adjusted to represent the amount of business being done with the currency. In other words, the amount of goods and services being exchanged have to all be represented by the coins. A stable value of the coins would be important to not let the currency become object of (financial) speculation. The way to keep the value of a coin stable is to introduce new coins as the use increases. This could even be done at any point in time when the coins have reached a value that is desirable. One could, in other words, keep the total of coins stable (and their value increasing) until a point has been reached where you’d say ok, the original adopters of the system now have been properly rewarded for their early efforts, but from now on the price of the coin will no longer increase, it will find a stable level. How to link the coins to the value of goods and services exchanged? 5) the total number of coins becomes no longer fixed, but should be amended to take account of the growth in users and adoption in cooperative enterprise. 6) the total number of coins gets linked to parameters internal to the currency: Number of active users and transaction volume. Those are available to the system. The system acts to increase the number of coins available when it detects an increase in adoption parameters. 7) The new coins thus becoming available are given to … (it is the community that should decide) I would suggest that the coins are equally distributed to all active users of the currency, i.e. each user gets to enjoy the fruits of the cooperative labor of the whole. The effect of this will be a rather stable currency (without large ups and downs), a currency that is of no interest to financial speculators. So with time, the coins that are now in the hands of the early adopters fill flow back into the system, the early adopters will have their just reward for their efforts, and Faircoin will be a coin of the cooperative movement, no longer a possible object of speculation. If you are interested to look into or perhaps participate in the discussions, the arguments that have led me to adopt this view, I have a Facebook group called Money and Economy, where a good deal of discussion took place on Bitcoin and money reform topics." Fairmarket, FairCoop’s virtual market that will allow members to use Faircredit, and anyone to use Faircoin. This page was last modified on 10 July 2017, at 07:15.